On the eve of the Reading game and on ‘Rocky Weekend’ I thought I would take the opportunity to catch up with a top man a good mate of mine, Ryan Rocastle, the son of the great late David Rocastle. He was only too happy to talk about all things Arsenal, his dad and Arsenal’s chancing of getting back in the top four this season. I remember talking to you before the spurs home game this season and you said that your dad would have been ‘bang up for that’ and off course the team showed the fight, us fans all want to see - what do you think of the teams chances of finishing in the top 4 this season? This season I think we probably have just the slight advantage over Spurs for fourth considering the run in and the fact that Spurs have been here before (last season) and choked. I think that will be fresh in their memory and last year we finished the season strong so hopefully we can do it again. I remember you coming out with the team as a mascot in the cup final in 2002 and I know you still come to games and had a flag up last season - how connected do you feel with the club your dad used to love? Personally I feel very, very connected to Arsenal - it's in my blood and I am a massive fan. I've been going to most the home games since I was about 12 and don't plan on stopping, I love the club. 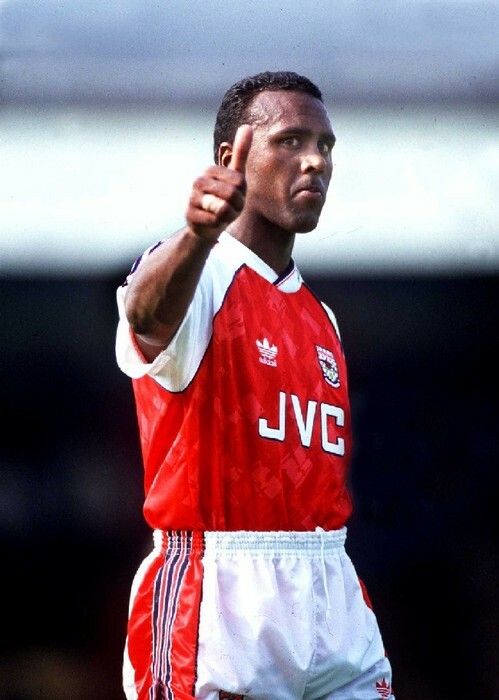 Various fans and fans groups are attempting to get an applause going on the 7th minute followed by chants of Rocky Rocastle - this must make you feel really proud? Yeah I heard about this through a friend actually. Obviously it makes you proud and happy that the fans still remember him. I see at Aston Villa that they applause for Petrov who was diagnosed with Cancer on the 19th minute I think as that was his number and I think it's a really nice tribute. How do you think your dad would feel knowing fans still sing his name home and away and in Europe? Well I know he would be very happy that the fans still remember him as this was his club and had the best time of his career here. He loved it at Arsenal and honestly didn't want to leave. The fans were always special to him but also as a footballer I think he understood what it meant to them and so would always take time out to sign autographs and take photos. I think some players don't really recognise how much they are adored by fans so just taking a few moments out of their time to speak to them is greatly appreciated. Thoughts on the current Arsenal team and the Manager? I think the current Arsenal team is probably a level or two below what we've had in the past, probably the weakest under Wenger. However I think we still have some very good players and some excellent youngsters as you can see in the Next Gen series. However, if we want to be back amongst the big boys the team needs investment. I really hope we can get into the top 4 this year because I do feel that in the summer, for the first time in ages, there are no star players that will leave us. If we can invest properly in the squad then it would be very interesting. Regarding Arsene Wenger I think it's been tough for him, I think he always tries his hardest and is desperate to make things work. I’ll be honest and admit that I have not agreed with a few things he's done in the last couple years. However, I have the utmost respect for him not just as a manager but as a person. As a manager people forget where we were before he took over, the great things he's done for the club, the style of football and the players he's brought in. Personally I don't agree with the abuse he gets and I am surprised at some of it. Personally I'm not too sure who we would bring in if he left. I would have been tempted to say Pep but that's not an option now after agreeing a deal with Bayern. In general some may want a change and that's fully understandable as fans they are entitled to their opinion but I think there's a way to go about it. As a person he's a great man, I've had a few conversations with him and what struck me most is how genuine he is. I think last year when we were sitting in a box and about 30 minutes before the game he came over to have a chat with us and was asking so many questions about what we are doing in life and where we want to go in the future and considering how busy he would have been, I find that amazing and a credit to him (we did win the game too!). Big thanks to Ryan for being so open and talking to me on a very special weekend for him and his family. Loved reading your articles. We would love it if you would also post your articles to www.fanalistas.co.uk, a new site for fan journalists/bloggers like you. We can automatically import your articles to your fanalistas profile and then link back to your blog giving your work exposure to our growing online community. I have no doubt that your Arsenal coverage would attract a lot of readers with us.